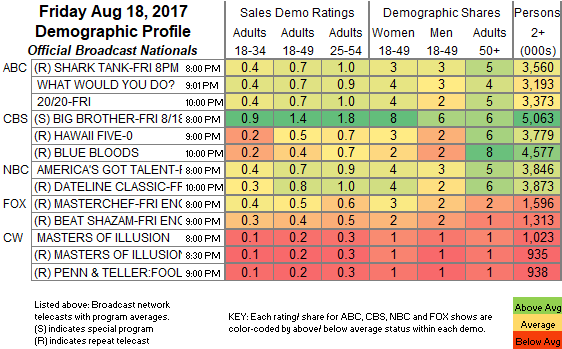 NETWORK FINALS: Due to NFL Preseason adjustment, the reruns of MASTERCHEF and BEAT SHAZAM went down 0.2 and 0.3, respectively, in final numbers. In addition, the BLUE BLOODS rerun lost 0.1. CABLE HIGHLIGHTS: Friday cable belonged again to A&E’s LIVE PD, down 0.7 from last Friday to 0.68. On HBO, REAL TIME WITH BILL MAHER dropped 0.07 to 0.42 (Note: ROOM 104 was listed as a rerun, but it’s not clear that was the case; if it was a new episode, it was down 0.06 to 0.11). 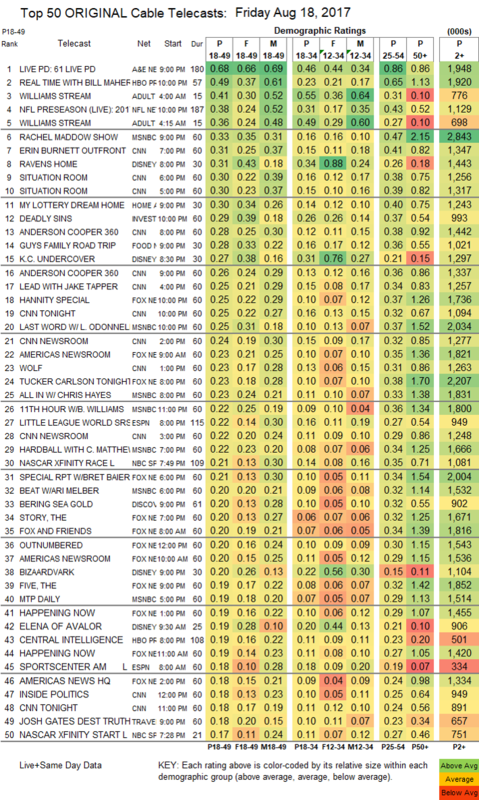 The 2 segments of Adult Swim’s WILLIAMS STREAM were at 0.41/0.36, compared to last week’s 0.35/0.31. NFL Network’s Preseason game was at 0.38. On the night of Steve Bannon’s White House exit, it was no surprise that MSNBC’s RACHEL MADDOW SHOW topped cable news at 0.33/2.8M, with CNN’s ERIN BURNETT OUTFRONT at 0.31/1.3M, and Fox News’s hANNITY at 0.25/1.7M. On Disney Channel, RAVENS HOME lost 0.04 to 0.31, KC UNDERCOVER ticked up to 0.27, and BIZAARDVARK was down 0.03 to 0.20. HGTV’s MY LOTTERY DREAM HOUSE was steady at 0.30. On ID, DEADLY SINS rose 0.06 to 0.29. Food Network’s GUY’S FAMILY ROAD TRIP was at 0.38. Discovery’s BERING SEA GOLD fell 0.04 to 0.20. was at 0.15, compared to last week’s 0.17/0.13, and MILLION DOLLAR MATCHMAKER ticked down to 0.13. On Syfy, KILLJOYS dropped 0.04 to 0.15, DARK MATTER was steady at 0.14, and WYNONNA EARP ticked up to 0.13. History’s ROAD HAUKS was at 0.10/0.11.